Click here or on the picture below to view and print your Tooth Fairy letter. It’s completely free but we’d really appreaciate a link on Facebook, Twitter or LinkedIn if you like it. Thank you. The image on this page has been blurred but clicking it will take you to a high res version. It has been handwritten, illustrated in watercolour, then scanned. It’s a good one for any child who has left a tooth for the Tooth Fairy to collect. What’s it about? The Tooth Fairy has written this letter as though she is sitting just outside your house, waiting for a ride home. This is because she cannot fly all the way back to her house in the clouds by herself and her moth, Flutterdust, has sprained his wing. It’s fun, magical and great for boys and girls. Like this? Get some more Tooth Fairy letters or check out our little Tooth Fairy notes. 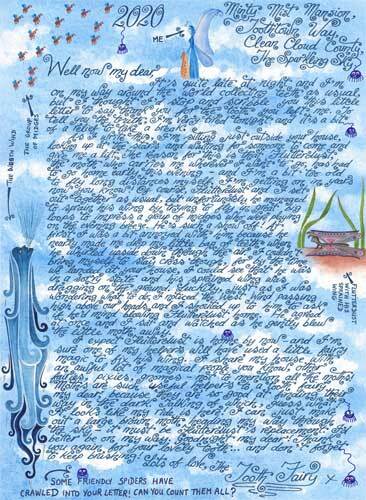 Further Info: In case you were wondering, all our Tooth Fairy letters are written using the idea that she is the builder of Fairyland – and that she uses all the teeth to build beautiful white fairy castles in the clouds. You can find out more about the Tooth Fairy here. We are also often asked who creates our letters – you can read more about their author here. Don’t forget, you can get that extra authentic look by printing a decorative cloud design on the reverse of your Tooth Fairy letter.